James Gale, with whom the pedigree in the “Reliquiae Galeanse” begins, was seated at Thirntoft near Scruton, in the hundred of East Oilling and North Riding, 1523; his eldest greatgrandson Robert, or Francis, at Akeham Grange, in the hundred of Ansty in the East Riding, 1590.
was born in 1636, at Scruton in Yorkshire. He was sent to Westminster-school, and, being admitted king’s-scholar there, was elected to Trinity college, Cambridge, and became fellow of that society He took his degree of B. A. in 1656; of M. A. in 1662. In the prosecution of his studies, he applied himself to classical and polite literature, and his extraordinary proficiency procured him early a seat in the temple of fame. 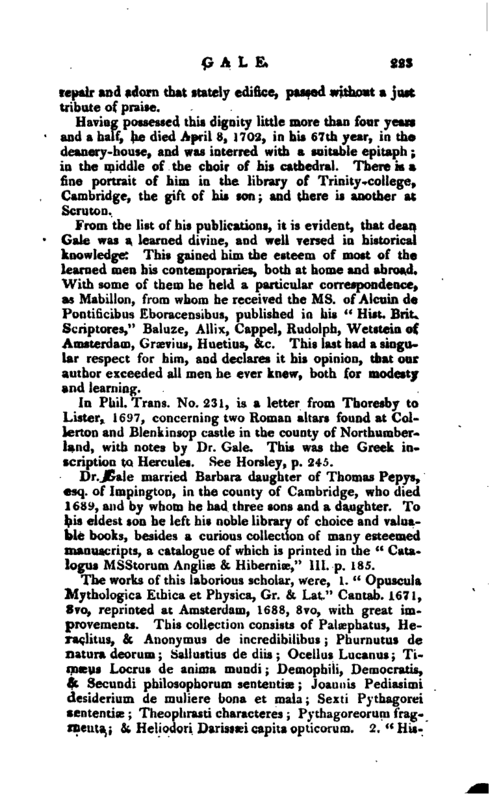 His knowledge of the Greek tongue recommended him, in 1666, to the office of regius professor of that language in the university, which he resigned in 1672; and his majesty’s Choice was approved by the accurate edition which he | gave of the ancient mythologic writers, as well physical as moral, in Greek and Latin, published at Cambridge iri 1671, 8vo. This brought his merit into public view; and the following year he was appointed head master of St. Paul’s school in London; soon after which, by his majesty’s direction, he drew up those inscriptions which are to be seen upon the Monument, in memory of the dreadful conflagration in 1666, and was honoured with a present of plate made to him by the city. 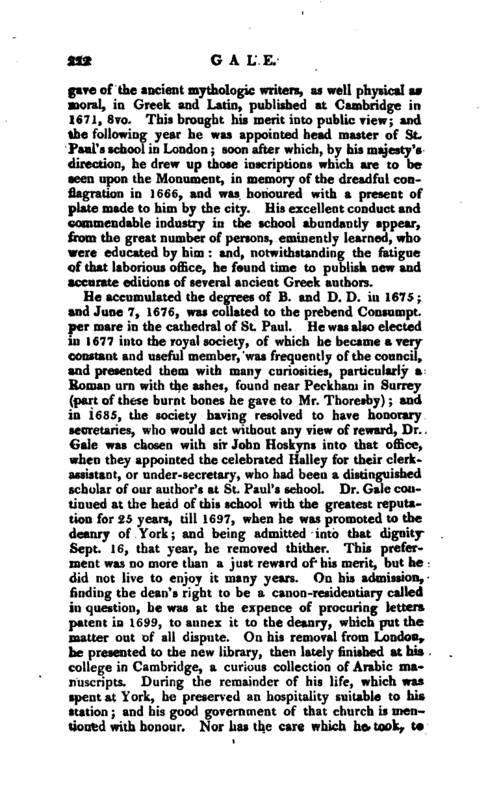 His excellent conduct and commendable industry in the school abundantly appear, from the great number of persons, eminently learned, who were educated by him: and, notwithstanding the fatigue of that laborious office, he found time to publish new and accurate editions of several ancient Greek authors. He accumulated the degrees of B. and D. D. in 1675; and June 7, 1676, was collated to the prebend Consumpt. per mare in the cathedral of St. Paul. He was also elected in 1677 into the royal society, of which he became a very constant and useful member, was frequently of the council, and presented them with many curiosities, particularly a Roman urn with the ashes, found near Peckham in Surrey (part of these burnt bones he gave to Mr. Thoresby); and in 1685, the society having resolved to have honorary secretaries, who would act without any view of reward, Dr. Gale was chosen with sir John Hoskyns into that office, when they appointed the celebrated Halley for their clerkassistant, or under-secretary, who had been a distinguished scholar of our author’s at St. Paul’s school. Dr. Gale continued at the head of this school with the greatest reputation for 25 years, till 1697, when he was promoted to the deanry of York; and being admitted into that dignity Sept. 16, that year, he removed thither. This preferment was no more than a just reward of his merit, but he did not live to enjoy it many years. On his admission, finding the dean’s right to be a canon-residentiary called in question, he was at the expence of procuring letters patent in 1699, to annex it to the deanry, which put the matter out of all dispute. On his removal from London,‘ he presented to the new library, then lately finished at hi9 college in Cambridge, a curious collection of Arabic manuscripts. During the remainder of his life, which was. spent at York, he preserved an hospitality suitable to his station and his good government of that church is mentioned with honour. Nor has that care which he took, to | repair and adorn that stately edifice, passed without a just tribute of praise. Having possessed this dignity little more than four years and a half, he died April 8, 1702, in his 67th year, in the deanery-house, and was interred with a suitable epitaph; in the middle of the choir of his cathedral. There is a fine portrait of him in the library of Trinity-college, Cambridge, the gift of his son and there- is another at Scruton. 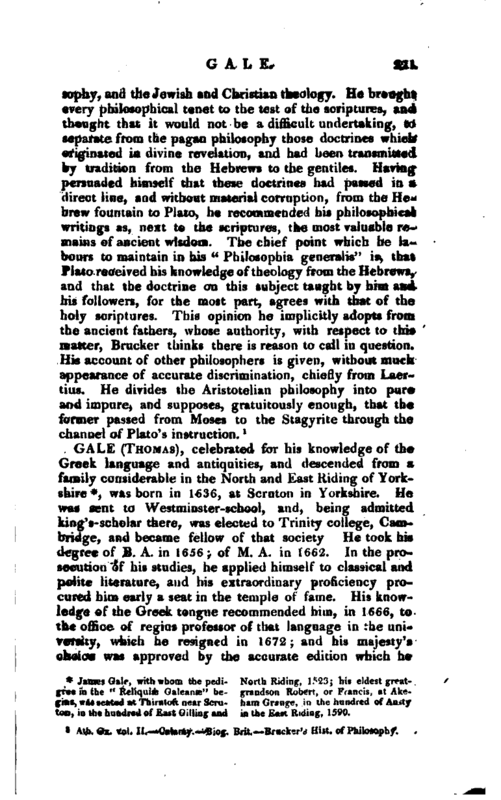 From the list of his publications, it is evident, that dean Gale was a learned divine, and well versed in historical knowledge. This gained him the esteem of most of the learned men his contemporaries, both at home and abroad. With some of them he held a particular correspondence, as Mabillon, from whom he received the ms. of Alcuin de Pontificibus Kboracensibus, published in his “Hist. Brit. Scriptores,” Baluze, Allix, Cappel, Rudolph, Wetstein of Amsterdam, Greevius, Huetius, &c. This last had a singular respect for him, and declares it his opinion, that our author exceeded all men he ever knew, both for modesty and learning. In Phil. Trans. No. 231, is a letter from Thoresby to Lister, 16S>7, concerning two Roman altars found at Collerton and Blenkinsop castle in the county of Northumberland, with notes by Dr. Gale. This was the Greek inscription to Hercules. See Horsley, p. 245. Dr. Gale married Barbara daughter of Thomas Pepys, esq. of Impington, in the county of Cambridge, who died 1689, and by whom he had three sons and a daughter. To his eldest son he left his noble library of choice and valuable books, besides a curious collection of many esteemed manuscripts, a catalogue of which is printed in the “Catalogus MSStorum Anglia; & Hiberniae,” Hi. p. 185. The works of this laborious scholar, were, 1. “Opuscula Mythologica Ethica et Physica, Gr. & Lat.” Cantab. 1671, 8vo, reprinted at Amsterdam, 1688, 8vo, with great improvements. This collection consists of Palaephatus, Hefaclitus, & Anonymus de incredibilibus Phurnutus de natura deorum Sallustius de diis Ocellus Lucanus; Timæus Locrus de anima mundi Demophili, Democratis, & Secundi philosophorum sententiae Joan n is Pediasimi desiderium de tnuliere bona et mala Sexti Pythagorei sententice Theophrasti characteres Pythagoreorum frag-, menta; & Heliodori Darisseci capita opticorum. 2. “| Historiæ Poeticæ Scriptores antiqui, Greecè & Latinè. Aecessere breves notæ, & indices necessarii,” Paris, 1675, 8vo. These are, Apollodorus Atheniensis, Conon Grammaticus, Ptolonutus Hephxstion, Parthenius Nicuensis, & Antoninus Liberalis. 3. “Rhetores Selecti, Gr. & Lat. viz. 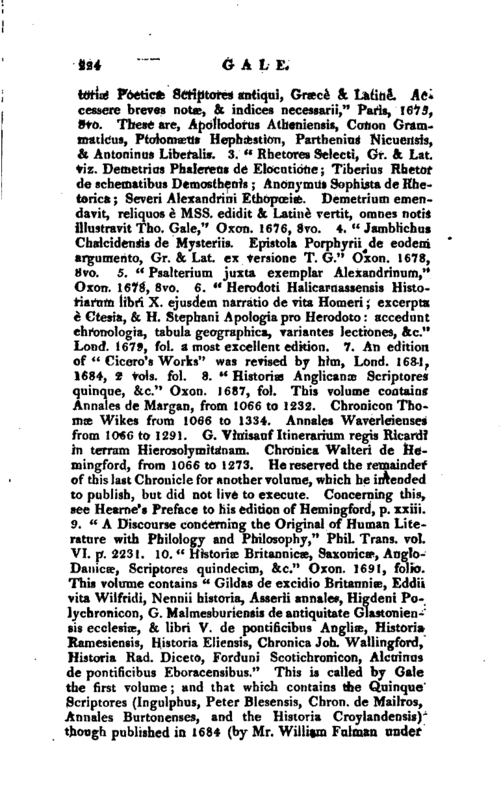 Demetrius Phalereus de Elocutione; Tiberius Rhetor de schematibus Demosthenis; Anonymu* Sophista de Rhetorica; Severi Alexandrini Ethopceisc. Demetrium emendavit, reliquos e Mss. edidit & Latine vertit, omnes notis illustravit Tho. Gale,” Oxon. 1676, 8vo. 4. “Jamblicbus Chalcidensis de Mysteriis. Epistola Porphyrii de eodem argumento, Gr. & Lat. ex versione T. G.” Oxon. 1678, 8vo. 5. “Psalterium juxta exemplar Alexandrinum,” Oxon. 1678, 8?o. 6. “Herodoti Halicarnassensis Historiarnin libri X. ejusdem narratio de vita Homeri excerpta e Ctesia, & H. Stephani Apologia pro Herodoto accedunt chronologia, tabula geographica, variantes Jectiones, &c.” Lond. 1679, fol. a most excellent edition. 7. An edition of “Cicero’s Works” was revised by him, Lond. 1681, 1684, 2 vols. fol. 8. “Histories Anglicanoe Scriptores quinque, &c.” Oxon. 1687, fol. This volume contains Annales de Margan, from 1066 to 1232. Chronicon Thomae Wikes from 1066 to 1334. Annales Waverleienses from 106t3 to 1291. G. Vinisauf Itinerarium regis Ricardi in terram Hierosolymitanam. Chronica Walteri de Hemingford, from 1066 to 1273. He reserved the remainder of this last Chronicle for another volume, which he intended to publish, but did not live to execute. Concerning this, see Hearne’s Preface to his edition of Hemingford, p. xxiii. 9. “A Discourse concerning the Original of Human Literature with Philology and Philosophy,” Phil. Trans, vol. VI. p. 2231. 10. “Historiae Britannicse, Saxonicae, AngloDanicae, Scriptores quindccim, &c.” Oxon. 1691, folio. This volume contains “Gildas de excidio Britannia-, Eddji vita VVilfridi, Nennii historia, Asserii annales, Higdeni Polychronicon, G. Malmesburiensis de antiquitate Glastoniensis ecclesiae, & libri V. de pontificibus Angliae, Histona Ramesiensis, Historia Eliensis, Chronica Joh. Wallingford, Historia Rad. Diceto, Forduni Scotichronicon, Alcuinus de pontificibus Eboracensibus.” This is called by Gale the first volume; and that which contains the Quinque Scriptores (Ingulphus, Peter Blesensis, Chron. de Mailros, Annales Burtonenses, and the Historia Croylandensis) though published in 1684 (by Mr. William Fulrnan under | the patronage of Bp. Fell) is called the second, as the authors are of a more modern date. 11. A collection of “Latin Prayers,” by dean Gale, in ms. was in the possession of Dr. Ducarel. 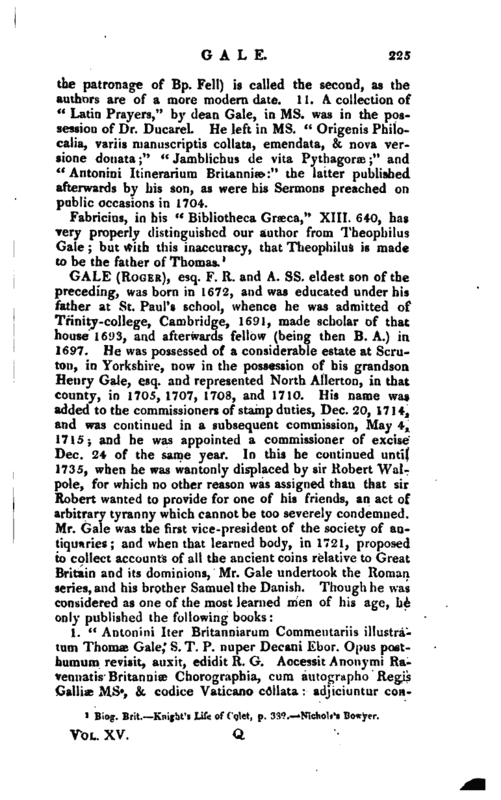 He left in ms. “Origenis Philocalia, variis manuscriptis collata, emendata, & nova versione donata” “Jamblichus de vita Pythagoras” and “Antonini Itinerarium Britannia” the latter published afterwards by his son, as were his Sermons preached on public occasions in 1704. Biog,. Brit. Knight s Life of Colet, p. 38^,-Nichols’s Bowyer.